Welcome home to this custom colonial nestled on nearly 4 wooded acres. Upon entering you will be greeted by a vaulted entryway and oak hardwood floors. The home features a gourmet kitchen with custom Kraftmaid cabinetry, SSl appliances, granite countertops, tile backsplash, large pantry, and overlooks the breakfast nook and living room. A French door leads out to the expansive deck overlooking the fully fenced in back yard, perfect for entertaining. The large living room showcases a stone gas fireplace and plenty of natural light. Upstairs you will find 3 guest bedrooms, all equipped with walk-in closets! The guest bathroom features dual sinks and a shower/tub combo. Double doors welcome you to the expansive master suite featuring two huge walk-in closets, a luxurious master bathroom with a garden tub, vanity area, dual sinks, large walk-in shower, and plenty of storage. 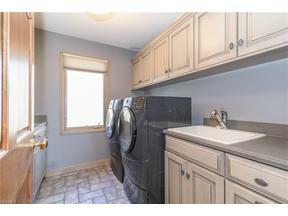 The laundry room with utility sink and tons of cabinet space complete the upstairs. The basement is finished and includes an amazing bar with sink, dishwasher, fridge, and plenty of room for seating and entertaining! Full bath and additional space for a family or bonus room and a walk-out to the lower patio and yard. 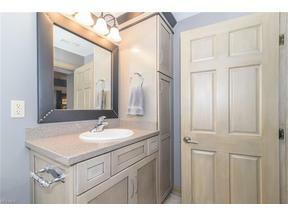 Outside you will find a 4 car detached garage with a 9.5' doors, quartz stone flooring, a half bath, and finished loft. The loft features approx. 1200 sqft of space, a full bar, tons of cabinet space, and room for plenty of seating. There is a full bath making this space the perfect game room!